Poverty is one of the strongest determinants of health, regardless of immigration status, according to a new study from the Dalla Lana School of Public Health and the Institute for Clinical Evaluative Sciences (ICES). “What our study found was despite the healthy immigrant effect, those living in the most deprived areas, irrespective of immigration status had the highest mortality rates,” says Laura Rosella, the study’s lead author, Assistant Professor of Epidemiology at DLSPH and ICES scientist. The “healthy immigrant effect” refers to a trend where new immigrants to Canada are healthier than the Canadian population, but over time and successive generations, their health as well as that of their children and grandchildren tends to decline. In the study, published today in Journal of Epidemiology & Community Health, the researchers examined data representing all deaths in Ontario from 2002 to 2012 to analyze how socioeconomic factors impact mortality according to immigration status. Anam Khan, an MPH Epidemiology student who worked with Professor Rosella at ICES on the study, described the study’s objective. 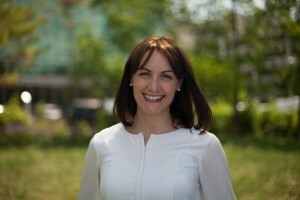 “One of the goals is to ensure that there are more equitable and favorable health outcomes for all Canadians and I think this study sheds some light on where and for whom improvements to health services and public health efforts need to be targeted in the population,” said Khan, who worked on the study as part of her MPH practicum in 2016. All-cause and premature mortality were about 60 per cent lower among immigrants compared to Canadian or long-term residents. Over the 10 year study period, this translated into 42,700 fewer deaths overall and 18,400 fewer premature deaths in immigrants compared to Canadian-born or long term residents. The average age at death for female and male immigrants was approximately six years younger than that of female and male long-term residents. In both immigrants and non-immigrants, those living in the most deprived areas had higher rates of all-cause and premature mortality, although immigrant mortality was lower across all levels. The advantage in all-cause and premature mortality among male immigrants over male long-term residents was slightly more pronounced than the advantage among female immigrants over female long-term residents. “These findings support the need to better examine the factors that drive these inequalities to ensure equitable health for the totality of the population,” says Rosella, who is also a scientist at Public Health Ontario. Banner photo by Tord Sollie via Flickr.